Although the professional, scientific, and technical industry sector makes up only 6% of the U.S. workforce, it was responsible for 10% of national job growth from 2010 to 2012. In addition, the broad industry (NAICS 54) grew by 6% in the past two years, which illustrates our nation’s march toward a more technical, STEM type workforce. There are over 9.2 million jobs in this industry, which is driven by sub-sectors like computer system design services and management, scientific, and technical consulting services. Adding a lot of jobs (computer systems design or custom computer programming). We have included the 2010 and 2012 job totals, change, % change, and top occupations that staff each industry. Many of these sectors can be thought of as “specialists” that generate their income by providing consulting or professional services to their consumers. NOTE: We have not included every sub-sector of NAICS 54 on this list. Computer systems design and custom computer programming services are the clear leaders and have added a ton of jobs — 89,000 and 71,000 jobs respectively, representing 12% and 10% increases. Software developers and computer system analysts are key occupations for these two sectors. If you are looking for a job, these are fantastic occupations and industries to focus on. While not a large sector, media buying agencies has the fastest % growth (23%) since 2010. This translates to nearly 3,000 new jobs in an industry that employs 15,000. From a talent perspective, advertising agencies (which grew by nearly 14,000 new jobs, or 7%, since 2010) is similar to media buy agencies. Advertising sales agents and public relations specialists are two common occupations that should be in demand across these two sectors. The second fastest growing sector is translation and interpretation services. In two years it has gained over 4,000 new jobs (17% growth). The biggest sector on this list is offices of lawyers. It employs 1.26 million, but has had zero job growth since 2010. These are the big “E’s” on the eye chart, but other sub-sectors are also worth noting. Research and development (research and development in the physical, engineering and life sciences and research and development in biotechnology) as well as testing laboratories are showing good growth. Together they have added 45,000 new jobs since 2010. They all employ medical scientists, biological and chemical techs, and chemists. Before we take a closer look at the actual occupations, let’s consider how these jobs are distributed. Using Analyst, we filtered for which states have the highest concentration of the 16 sub-sectors. Maryland, Washington, D.C., and Virginia have by far the highest concentration of these industries. These three geographies are also the only areas that we would call “highly specialized” for these jobs, which means that the concentration of professional, scientific, and technical jobs is more than 60% greater than the national average, and is actually getting closer to twice what a typical region has. After that, we see that Massachusetts, New Jersey, Colorado, New Mexico, and California have concentrations between 1.2 and 1.59, which means the jobs are 20-60% more concentrated in these states (the national average equals 1.0). Now, if your state doesn’t have a high concentration of these jobs at the moment, fear not. Quite a few states out there have shown some pretty impressive growth for these industries over the past two years. In particular, North Dakota (17% since 2010), Delaware (13%), Georgia (12%), Utah (11%), Vermont (11%), New York (11%), Washington (11%), and South Carolina (10%). A lot of states have shown moderate growth and just a handful have actually declined. So what jobs are we talking about? We’ve mentioned a few already, but you’ll see a list of the top occupations for the 16 aforementioned sub-sectors below. These are jobs that we could consider “emerging” as these sectors continue to thrive. Note: The growth of these occupations isn’t quite as high as we’ve seen for some of the sub-sectors. This is mostly because the occupations are staffed across other industries that aren’t growing quite as much (or not at all). All but four of the 18 occupations are dominated by a workforce that has attained at least a bachelor’s degree. The only jobs where this is not the case are bookkeepers (39% have some college, no degree), medical scientists (64% doctoral degree), lawyers (97% professional degree), and surveying and mapping technicians (37% some college, no degree). Translators and software developers have the highest growth percentage (8.2% and 8.0%, respectively) since 2010. They are followed by medical scientists (7%) and mechanical engineers (6.5%). Lawyers, architects, and surveying and mapping techs did not experience any growth since 2010. Computer systems analysts – Analyze science, engineering, business, and other data processing problems to implement and improve computer systems. Management analysts – Conduct organizational studies and evaluations, design systems and procedures, conduct work simplification and measurement studies, and prepare operations and procedures manuals to assist management in operating more efficiently and effectively. Biological technicians – Assist biological and medical scientists in laboratories. Set up, operate, and maintain laboratory instruments and equipment, monitor experiments, make observations, and calculate and record results. May analyze organic substances, such as blood, food, and drugs. Medical scientists – Conduct research dealing with the understanding of human diseases and the improvement of human health. Engage in clinical investigation, research and development, or other related activities. Includes physicians, dentists, public health specialists, pharmacologists, and medical pathologists who primarily conduct research. Interviewers – Interview persons by telephone, mail, in person, or by other means for the purpose of completing forms, applications, or questionnaires. Ask specific questions, record answers, and assist persons with completing form. May sort, classify, and file forms. Advertising sales agents – Sell or solicit advertising space, time, or media in publications, signage, TV, radio, or Internet establishments or public spaces. Surveying and mapping technicians – Perform surveying and mapping duties, usually under the direction of an engineer, surveyor, cartographer, or photogrammetrist to obtain data used for construction, mapmaking, boundary location, mining, or other purposes. Though it is small, the professional, scientific, and technical sector is responsible for a greater and greater share of jobs. The jobs tend to be more concentrated in specific areas, namely Maryland, D.C., and Virginia. The jobs tend to be associated with four-year degrees. The industries tend to be more highly specialized — meaning, they add value and do a lot of consulting work based on that expertise. Business operations, logistics, software, scientific research, and engineering are the major areas of focus. Data and analysis from this report came from Analyst, EMSI’s web-based labor market tool. Please contact Rob Sentz (rob@economicmodeling.com) if you have questions or comments. Follow us @desktopecon. 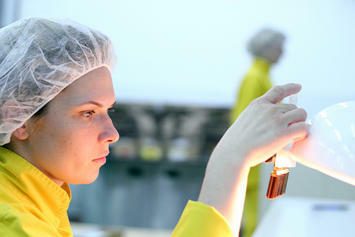 Lab technician photo by Bigstock.